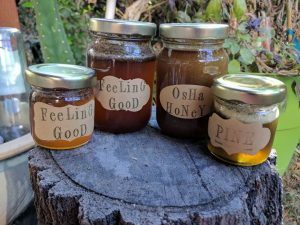 Herbal Honies Archives - Free Spirit & Mind! Herbal honies is simply herbs that have soaked in honey to make a medicinal honey. My favorites are the Feeling good & the Osha. But so many are incredibly delicious you will be blown away. There is no need to use regular honey any more once you’ve started using herbal honies. My son absolutely loves the osha. Although, he likes them all. Sometimes I find him in the cinnamon, or the pine. However, he does remind me of Pooh Bear, since at times, it seems, he can only think of honey! Use it to add to tea, eat it plan, spread on toast or figure out another delicious way to enjoy it.